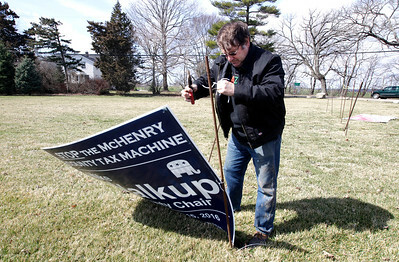 H. Rick Bamman - hbamman@shawmedia.com McHenry County Board chairman elect Mike Walkup removes a campaign sign at the corner of Crystal Springs Rd. and Walkup Rd. in Bull Valley on Wednesday, March 16, 2116. 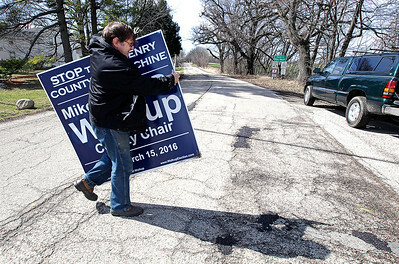 This election is the first in which McHenry County voters are directly electing the chairman. Joe Gottemoller, who has been chairman since 2014, was the last chairman to be chosen by the 24-member County Board – voters in 2014 passed a referendum to end the practice.